In this review I will highlight the best face balanced putters you can buy in 2019 if you are in the market to add a new putter to your golf bag. Face Balanced putters are phenomenal club selections for beginners because it centers the weight evenly throughout the clubface making the putter much easier to control and keep straight during the putting stroke. The alternative option is the toe-weighted putter which tends to swing open and shut throughout the putting stroke making it difficult to square up and hit the ball straight. Most face balanced putters are mallet style putters but occasionally you’ll find a blade style putter that also has the face balanced feature by widening the sole. Odyssey is one of the best golf brands for designing putters and they are owned by parent company Callaway Golf. With the O-Works #7 Putter, Odyssey modified the mallet putter to include weight balancing wings (or fangs like we call them) and came up with this sharp design. The face features Odyssey’s micro-hinge technology which helps your putts roll smooth by adding topspin at impact regardless of the type of putting stroke you have. Look at the image below and you’ll see the stainless steel Microhinge plate that Odyssey co-molded into a Thermoplastic Feel Layer. This essentially gives your hands more feel as the the ball comes off the putter face to give you feedback on your putts so you can make adjustments and get better, more true roll with proper distance control. 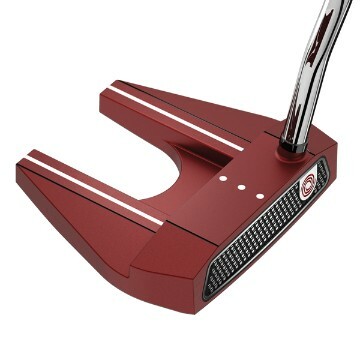 The red finish with white and black accent lines makes this putter design pop. 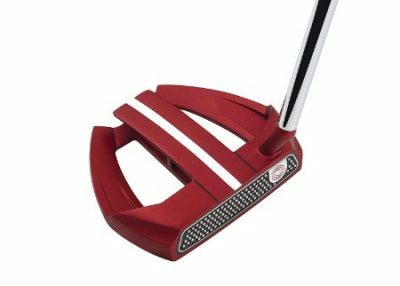 It’s a very popular color choice among tour players with Jason Day being an example of someone playing a red colored putter. Additionally, the O-Works #7 Face Balanced Putter has a sweet underside design with plate inserts that evenly distribute the weight throughout the putter, creating that “face balanced” effect. The shaft has double bend to help you visually at address. The 7S model has a more slanted shaft and a plumbers neck to create more toe hang if you prefer more arc in the stroke. Overall, the Odyssey O-Works #7 is my favorite putter choice as I currently play the same model but in a white & black design. I will be switching to the red model in the near future. The O Works Marxman is another great option for a face balanced putter. It also features the new microhinge face insert which has small micro hinges that help the ball immediately roll end over end with topspin. 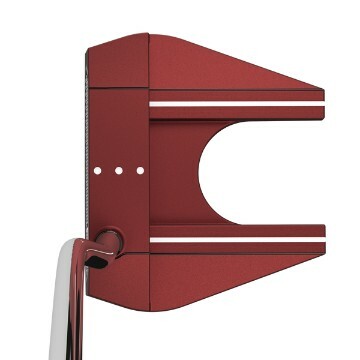 The red paint color for the putter head with black face insert helps contrast this putter design and make it pop. I love the stylish look from this color scheme that Odyssey came up with in their Red O-Works series. The white stripe line helps you align your putts easier at address to start them on line and increase the number of putts you make per round. You’ll love the confidence you feel when putting with a visually helpful putter thanks to these accent markings and white stripe. The weight of the face balanced putter is evenly distributed and the rounded wings that connect in the back, help make this putter head easy to control during the swing. Odyssey used the slanted shaft design in the O-Works Marxman to increase toe hang and promote more arc in the putting stroke. This is a feature highly requested by tour pros and something you’ll have to feel out to decide if you like it or not. 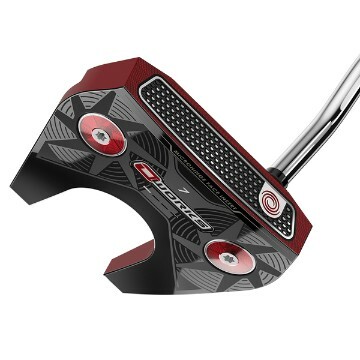 The new Spider X putter by TaylorMade is one of the best putters on the market as a whole in addition to being one of the best face balanced putters. It has two hosel options as well so if you don’t want the face balanced option, you can get a 30 degree offset to promote arc in your putting stroke. The first thing you’ll notice is the new color scheme choices offered in the Spider X Model. Previously, the Spider came in its famous Red design but the new Spider X offers navy blue and Dakota Copper as color options. It comes with a SuperStroke Pistol GTR 1.0 grip for amazing feel in your hands and added confidence when gripping the putter at address. Technology wise, the Spider X has added metal weights on the outside back edges of the putter and shifted the weight of the putter head away from the center, more out to the edges. This has increased MOI wider on the putter face to help off-set mishits and maintain true distance regardless of where struck on face. The new face insert is thicker and deeper to help promote more pure roll on putts while also giving great feel and feedback. Thanks for reading our review of the best face balanced putters in 2019. Make sure to check out our resources below that golfer’s love following to improve their scores quicker. We’ve helped thousands of golfers and look forward to helping you too!